Huang Hsiu-Yi was born in Yunlin, Taiwan, and graduated from the Graduate Institute of Studies in Documentary and Film Archiving, at Tainan National University of the Arts. She is now an independent filmmaker, who specializes in documentary and short film directing and production. In 2011, she began paying attention to the life of new immigrants in Taiwan and Southeast Asian countries and organized the Migration Film Festival hosted by the South Taiwan Film Association. 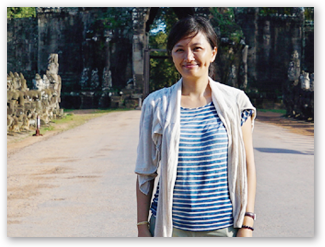 In 2015, she was selected and awarded a grant by the Wanderer Program in association with the Cloud Gate Culture and Arts Foundation, which enabled her to travel the length of the Mekong River, visiting Thailand, Laos, Cambodia and Vietnam in order to document the interactive and symbiotic relationship between the locals and the river. During her journey, she also keenly observed the improving living conditions and the economic development of member countries in the Association of Southeast Asian Nations (ASEAN). She currently works in both Taiwan and Burma filming new works on topics related to the New Southbound Policy. Her work centers on issues for women, ecology and the environment as well as Taiwan’s current agricultural conditions. In addition to film production, she has worked for the South Taiwan Film Association and served as CEO and curator of the South Taiwan Film Festival between 2004 and 2010. She also dedicates her time to promoting film education, making efforts to introduce documentaries and films to different communities in southern Taiwan.